Tout Simenon (PDLC '91-'92): Tome 25, pp. 246-269 (24pp). M, in retirement at Meung-sur-Loire, has taken to spending his days playing manille at the Grand Café, where he has become one of the regulars. The other players sometimes vary, including Hubert, the butcher, whose shop is across the way, Urbain, the veterinarian mayor, Citroën, the mechanic, the blacksmith, and sometimes the café owner played as well. One evening, after the game, the news came in that the butcher had been killed. He'd had a lot of cash with him and had told everyone he was driving it over to the notary's for safekeeping. 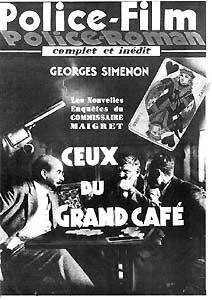 M shows no interest in the case at all, even though everyone comes to see him about it, including Angèle, the 20-year-old waitress at the café, whom the butcher was in love with, and Urbain was as well, the mayor himself, and Gabrielli, the superintendent. M's refusal to participate puzzles and annoys everyone, but eventually the crime goes unsolved. A few years later, after several people have died, M explains to his wife that he'd realized quickly that it had been a suicide made to look like a murder, so that his wife would collect the insurance. He had refused to participate since he didn't see why he should have a hand in denying the family the money.